King Edward VI was born Edward, Duke of Cornwall at Hampton Court Palace on the 12th October 1537. He was the only child of Jane Seymour, the third wife of Edward’s father King Henry VIII . She subsequently died twelve days later of postnatal complications. The Kingdom rejoiced at his birth and greeted the male heir to the throne with joy and relief. Though Henry’s happiness was tempered by the bitterness he felt at losing Jane his wife. King Edward VI – The early years. There is some dispute over Edward’s health as an infant. Historians have been divided about whether he was a fit or sickly child. 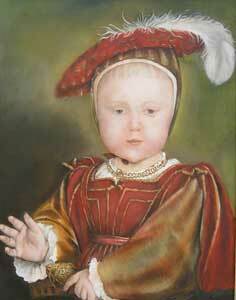 Though Hans Holbein the younger‘s portrait of him at two years of age certainly depicts him as a healthy one. Edward did fall ill when he was four, with a life-threatening Quartan fever, but despite occasional bouts of ill health and poor eyesight, he generally enjoyed good health right up until the last six months of his life. Edward’s education was placed in the hands of his primary tutors Richard Cox, John Cheke and Roger Ascham (the latter of whom also taught Edward’s sister Elizabeth). They all followed the new Protestant faith, which explains why Edward ultimately acquired such staunch Protestant beliefs himself. Edward was given a rigorous education and intellectually he was precocious, being fluent in Greek and Latin. By the age of thirteen he had read Aristotle’s “Ethics” in the original, and was himself translating Cicero’s De “Philosophia” into Greek. 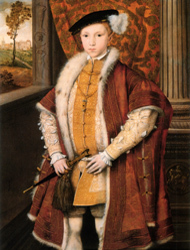 King Edward VI – The Boy King. In January 1547 his father, King Henry VIII died. As Edward was only nine years of age at the time, his father had previously arranged that a council of regency should rule on his behalf until he became of age. However his uncle, Edward Seymour – Duke of Somerset took power and established himself as protector. The Duke of Somerset, aided by Thomas Cranmer – Archbishop of Canterbury and with the support of the young King, pushed forward with the Protestant Reformation and the Church. Changes were soon made, including the introduction of an English Prayer Book in 1549, with an Act of Uniformity to enforce it, along with the decision to allow members of the clergy to get married. Attempts were also made to remove many aspects of the Catholic Church, such as stained-glass windows in churches and the destruction of religious wall-paintings. These actions incensed many people, inciting peasants in the West Country to revolt in protest against the new Prayer Book in the summer of 1549. In Norfolk, Kett’s Rebellion was focused on social and economic injustices. At the same time, the French declared war on England. John Dudley– Earl of Warwick and later to be the Duke of Northumberland, was able to suppress the Norfolk rebellion and taking advantage of the atmosphere of uncertainty, exploited his success by bringing about the downfall of Somerset. He was later arrested and executed allowing Dudley to assume the role of Protector. Protestant reform was pressed forward with the new Prayer Book of 1552. Catholic altars were turned into tables, religious imagery destroyed and religious orthodoxy enforced by a new and even more stringent Act of Uniformity. King Edward VI – His untimely death. In early 1553, Edward became unwell with cold symptoms, but over the following months he became worse. Edward steadily declined and by the late spring of that year, it became clear that he was going to die. It is now presumed that he was suffering from tuberculosis. As Edward had no heirs he was to be succeeded by his sister Mary, a Catholic. However Northumberland was determined that his religious reforms should not be undone, so he persuaded Edward to approve a new order of succession. Mary was declared illegitimate and as Elizabeth was also excluded, the throne was passed to Northumberland’s daughter-in-law, Lady Jane Grey, a more distant descendant of Henry VIII. When King Edward VI died, Jane took the throne but she was only Queen for nine days until, with overwhelming popular support, Mary then took it. The Duke Northumberland was subsequently arrested on the 24th July and beheaded on the 22nd August, shortly after renouncing Protestantism. This dismayed his daughter-in-law, Jane, who followed him to the scaffold on the 12th February 1554, after her father’s involvement in Wyatt’s rebellion. King Edward VI died at Greenwich on the 6th of July 1553. He was then buried in Henry VII‘s chapel by Cranmer with Protestant rites on the 8th of August, while Mary had Mass said for his soul in the Tower. If you have enjoyed reading this article on King Edward VI, please share your appreciation on one or more of the social buttons above – thank you.